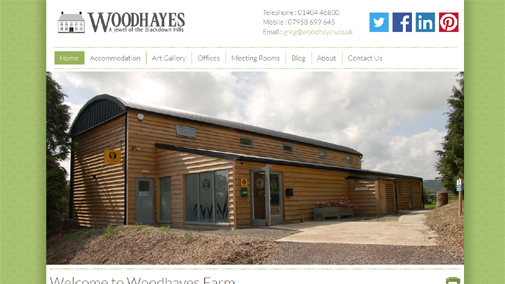 Woodhayes Farm came to Cosmic requiring a new, refreshing website. The website needed to be able to show off the excellent services Woodhayes can offer it's customers, and the Cosmic website developers crafted a website with subtle, earthy colours which also brings out the beauty of the Blackdown Hills and surrounding areas. The website features multiple galleries displaying high quality photographs of the accomodation, as well as booking availability and social media integration. The addition of responsive templates ensures potential customers can view the website on their mobile and tablet devices at ease without the need for pinching and zooming to read content.